Sheet pan meals are the best! I’m a total convert guys! 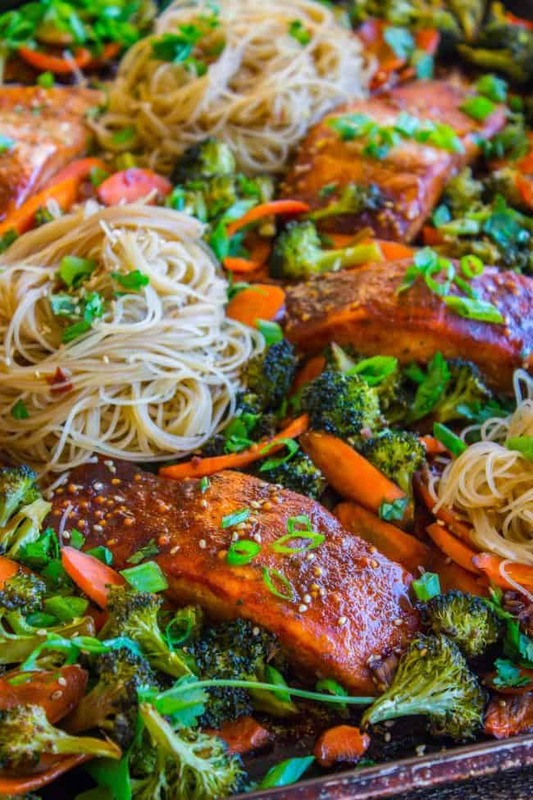 This one features chili spiced salmon with broccoli, carrots, and rice noodles. It is super easy to throw together, done in 30 minutes! Guys, there’s an EMERGENCY going on over here. Our dishwasher broke. Like, for real this time. It broke last week and I was hand washing dishes for days (the horror!) before it was fixed. Now it’s broken for good and the new one is not coming for a whole week. Word to the wise my friends: do not spend money on a new part and pay for labor on a dishwasher that is original to your house, which may or may not be 25 years old. Even if it’s a Maytag. Eric was optimistic. We will just use paper plates! No problem! I was like, you do remember that I COOK FOR A LIVING. Do you have a paper plate version of a skillet? A paper skillet? How about a paper pot, or a paper mixing bowl?? I’m just going to be over here in the kitchen, starting a fire on the stove, no problem. Have you guys ever tried rice noodles? I just made them for the first time a few weeks ago and was super impressed. 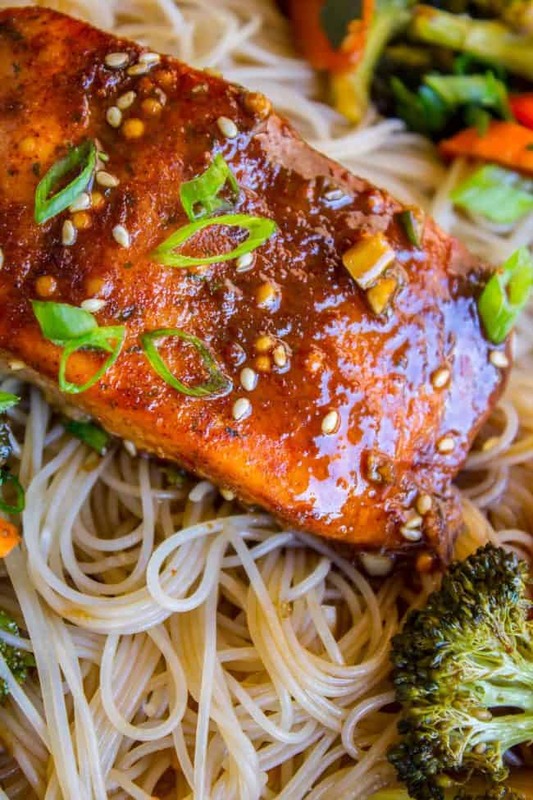 They are delicious with stir fry or cashew chicken or any other stovetop Asian meal, not to mention this salmon dish of course. You don’t even have to cook them OR STIR. Amazing right? You literally just have to boil a pot of water, dump it on top of the noodles and wait a few minutes. It totally reminds me of that one time on Gilmore Girls when Luke asks Lorelai to stir something on the stove for him and she’s like, “I don’t cook.” I think even she could handle rice noodles. Have you ever heard of Sea Cuisine? It’s like pre-marinated fish filets that are ready to cook from frozen. They are AWESOME. I’m partnering with them for this post and I couldn’t be happier about it. The best part about fish for dinner is how fast it is to throw together. But I still have to thaw (I usually buy it frozen), then marinate, then cook. This skips the thaw step, making my life even easier. Why is the defrosting process so arduous to me?? I would rather chop 1000 vegetables than thaw frozen meat for some reason. Speaking of veggies. Broccoli and carrots are delicious when roasted. 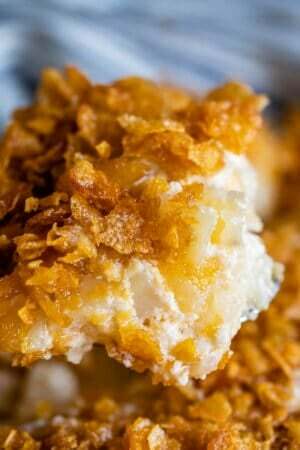 They are crisp-tender, don’t expect them to be mushy soft. But it really works with the texture of the salmon and the sweet spicy Asian sauce. I love it! Let me know if you guys try this one out! Tag #thefoodcharlatan on Instagram! Sheet pan meals are the best! I'm a total convert guys! 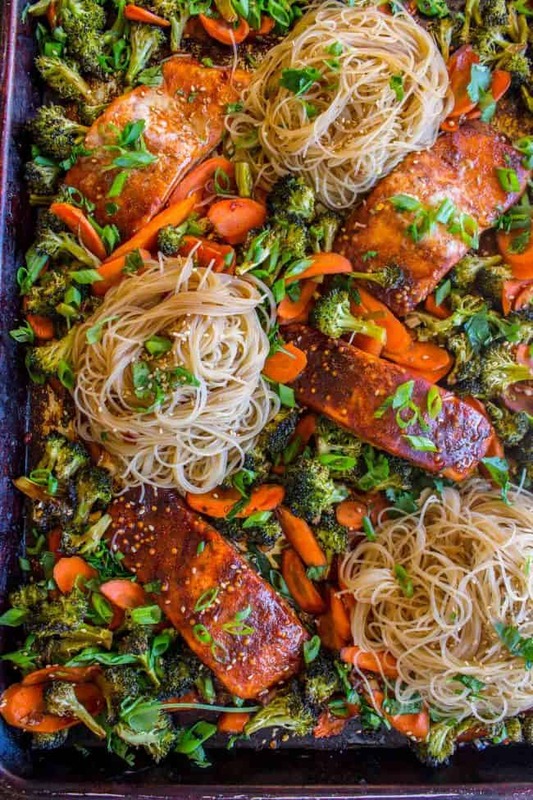 This one features chili spiced salmon with broccoli, carrots, and rice noodles. 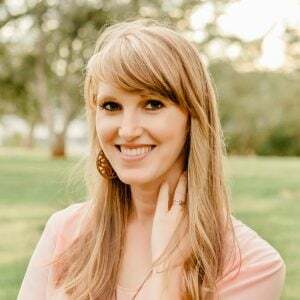 It is super easy to throw together, done in 30 minutes! 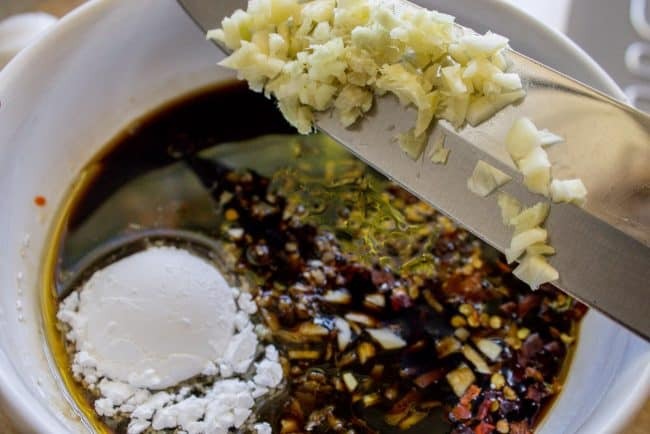 In a glass measuring cup, whisk together all sauce ingredients: rice vinegar, cornstarch, brown sugar, soy sauce, sesame oil, Sriracha, red pepper flakes, garlic and ginger. Set aside. Add a small drizzle of oil to the sheet pan and rub it on with your hands. Or coat generously with nonstick spray. Chop the broccoli into bite size florets. Slice the carrots into thin (no more than 1/4 inch) slices. Add the vegetables to the pan. Pour 1/2 cup of the sauce over the vegetables and use your hands to toss and coat. Sprinkle with 1 teaspoon salt. 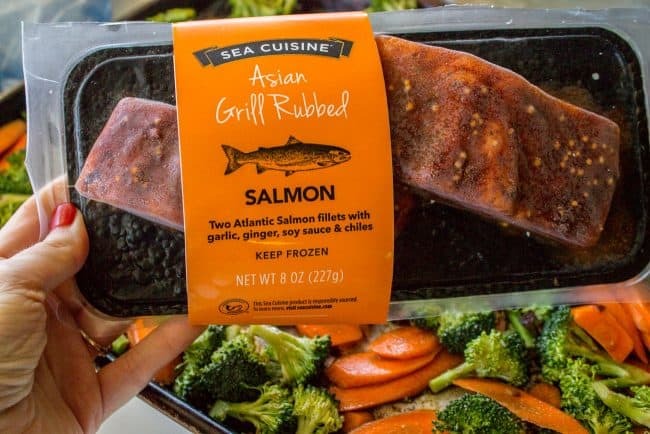 Add the FROZEN Sea Cuisine Salmon filets to the pan, making sure the salmon is touching the pan and not on top of any veggies. Remove from the oven and stir the vegetables. (Try to turn them over but it doesn't need to be perfect.) Don't disturb the salmon. Move quickly so that you can get it back in the oven right away. 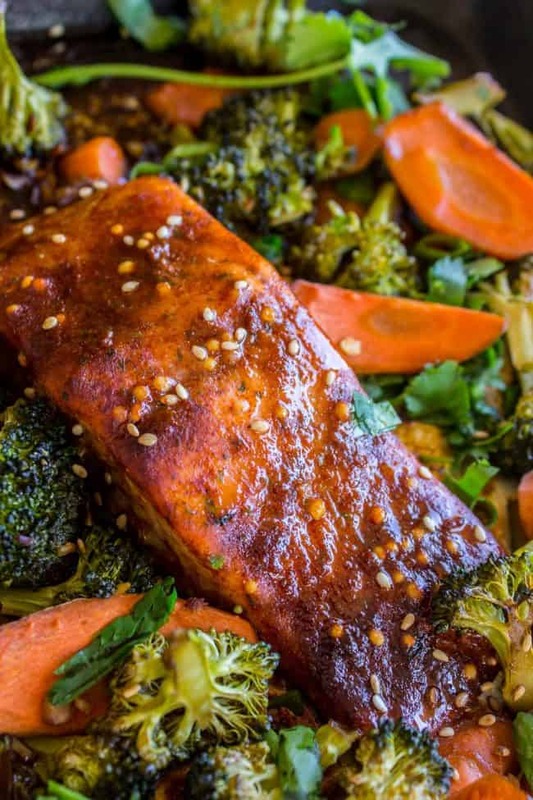 Roast for another 10-12 minutes, until the broccoli and carrots are crisp-tender and the salmon is cooked through (145 degrees internal temperature). Meanwhile, boil a medium pot of water on the stove. Season with 1 teaspoon salt. When it is boiling, turn off the heat and add the package of rice noodles. Let sit for about 5-8 minutes. You don't even need to stir it or anything. It's like magic!! You can transfer the noodles to the pan in 4 sections like in the photos if you want, to make serving simple. Or just serve them in a separate bowl. *You can use garlic from the jar if you want. You can even sub garlic powder and ginger powder if you want, I'm no judge here people. I'm thinking maybe 1 teaspoon each? 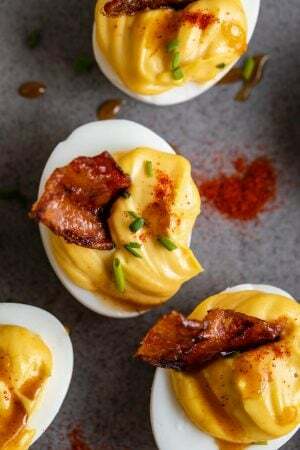 More easy meals I’m sure you will love! 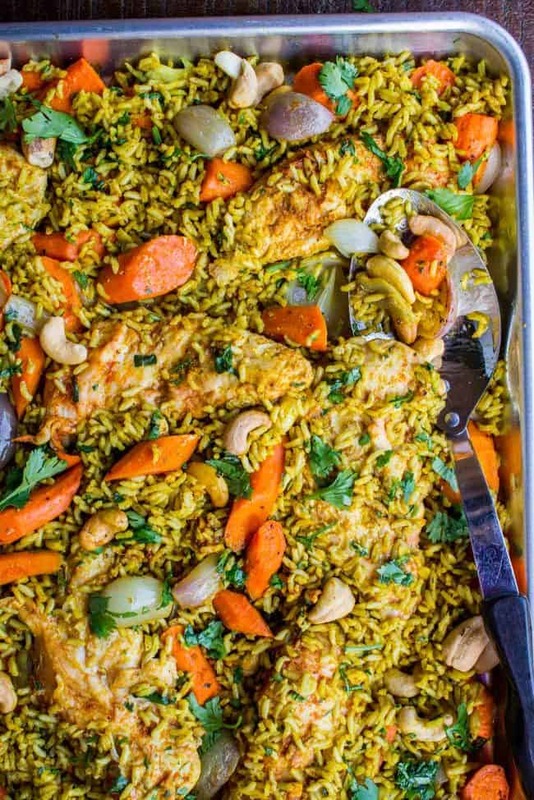 Sheet Pan Curry Chicken and Carrots (Biryani) << you will loooove this one, my friends! 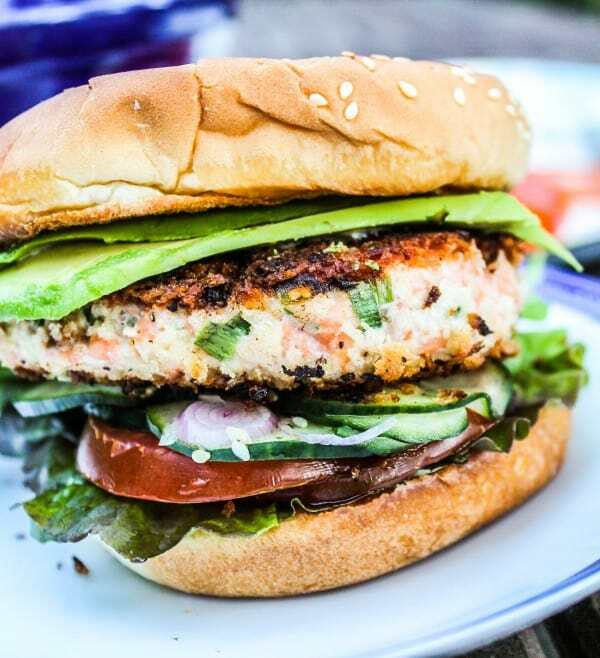 Asian Salmon Burgers with Wasabi Mayonnaise << this is an old recipe I got from Foodie with Family. It’s delicious! 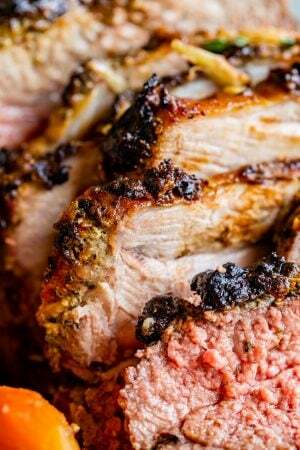 Asian Pork Tenderloin with Ginger Glaze << a very popular recipe on The Food Charlatan! 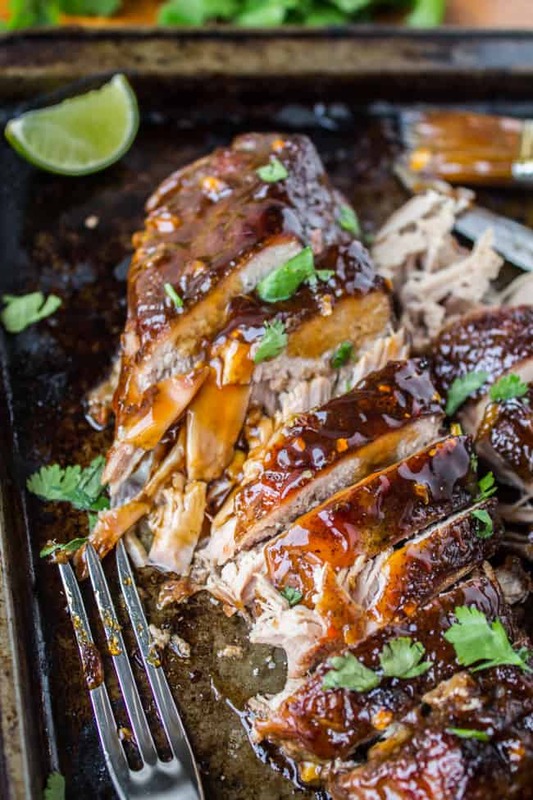 More Asian sheet pan meals from blogger friends! First recipe from this site that I tried. It’s was really great. My whole family loved it. we needed a little extra sauce but it was so easy to prep. I most ate the whole bowl of raw veggies after they were tossed with the sauce. That’s awesome, I’m so glad you guys loved it! The veggies are killer, right? :) Thanks so much for your review Augs! This looks delicious but we don’t have that salmon where I live. How should I season plain salmon to replicate the flavours? Hey Dani! Here’s what I would do. Make 1 and 1/2 the amount of sauce. Use 1/3 of the sauce to add to a ziplock bag with the thawed salmon filets you’re using. 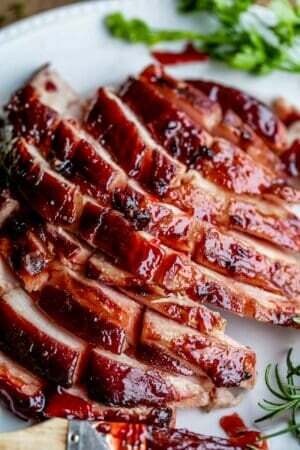 Marinate for 20 minutes. Bake the veggies for the first 12 minutes as directed in the recipe, then add the salmon to the pan (not on top of veggies, directly on pan.) Bake for another 15 minutes or so. Hope this helps! This is absolutely brilliant. Looking forward to more sheet pan meals. I am such a fan of yours. Thank you for sharing these wonderful recipes. Seriously, having any household appliance break is the worst! #adulting is so hard when you’re #homeowners. And I’m digging one pan meals too! This looks delicious! I love rice noodles. I could live off of Asian flavors. This looks wonderful! Thanks Amy! I think I could too! Hi,Karen! Your recipe is mouth-watering! 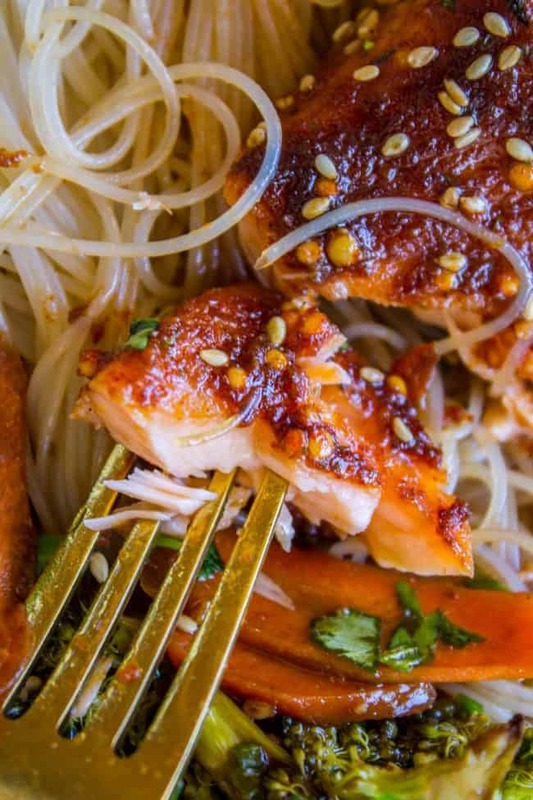 I really like how you combine rice noodles and salmon on the tray.